Digital Gujarat is an online portal that has been developed by the Government of Gujarat for the assistance of citizens. It is designed to facilitate the citizens of the state to avail various online services under a single portal. People can register into the portal to access all the services offered by the Gujarat government. In this article, we look at the Gujarat citizen services, Business services, and financial services in detail. Digital Gujarat is meant to deliver numerous services of the state government. A common resident can use this online portal to avail the following services. Some services can be applied or registered online using the Digital Gujarat portal. The portal has the benefits of the service request, online payment, approval of services and service delivery. All citizen services, Revenue services, employment services, Panchayat services, and Business services can be availed under a single portal. The portal provides easy and quick access to all the services and can also check the status of the application. This digital portal facilitates various online service request with various departments. The below mentioned are the list of citizen services available under the Digital Gujarat portal that can be applied or registered online. Application of New Ration card, Separate Ration card, Duplicate Ration card, Ration card Member Guardian, Addition of name in Ration card, Change the name in Ration card. Special stipend or help for the candidates preparing for the civil services, UPSC or have cleared the exams. If a student took a break from studies, then they have to admit a Break Affidavit. Step 1: The applicant must visit the Digital Gujarat Portal (https://www.digitalgujarat.gov.in/) to avail all the government services. Step 2: In case you are a new applicant of the Digital Gujarat portal, you have to register in the portal to avail all the services offered by the government. Then click on the option “Register” for the New User Registration. Step 3: You will be directed to the registration page where you have to enter the following details. Step 4: After entering all the details you have to click on the “save” button. Step 5: Then your citizen profile will be created successfully upon completing the Digital Gujarat Registration. Step 6: To portal login, you can use any of these two following methods to log in. Step 7: You have to click on the “Login” button that is visible on the homepage of the portal. Step 8: Then select the login type that would provide you with three options such as Aadhaar card, Mobile Number and e-mail address. Step 9: Then you have to enter your username, password and captcha code. After that, you would be able to login to the Digital portal. Step 10: Now you are eligible to request and apply for any services which are available at the web portal. Step 11: You have to click on the “Office Login” button that is visible on the homepage of the portal. Step 12: Then you have to enter your username, password and captcha code. After that, you would be able to login to the Digital portal. The users can verify the application status by visiting the official portal. By clicking on the “Check Status” tab of the dashboard, the status of the application applied can be verified. If the application has been approved, then you will be facilitated to download the certificate by clicking on the option ”Download Issued Document” from the portal. 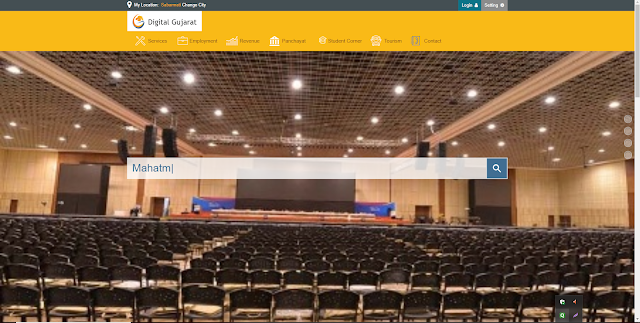 0 Response to "digitalgujarat.gov.in - Digital Gujarat Registration & Login"